With unraveled embroidery and fraying hems, the Traveling Pants are back for one last, glorious summer. Lena - Immerses herself in her painting and an intoxicating summer fling, fearing that the moment she forgets about Kostos will be the moment she sees him again. Carmen - Falls under the spell of a sophisticated college friend for whom a theatrical role means everything and the heritage of the Pants means nothing. Bridget - Joins a dig for an ancient city on the coast of Turkey and discovers that her archaeology professor is available in every way except one. Tibby - Leaves behind someone she loves, wrongly believing he will stay where she has left him. Join Ann Brashares's beloved sisterhood once again in a dazzling, fearless novel. 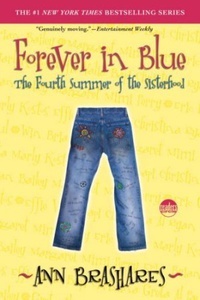 It's a summer that will forever change the lives of Lena, Carmen, Bee, and Tibby, here and now, past and future, together and apart.